I am a voracious reader and running out of room on my shelves for any more books,so for Christmas my family gave me a tablet, which can be used as a kindle. What a treat it has been to lay in bed, all toasty and warm and sample new literature through Amazon. After reading Running to the Mountain, I sampled Jon Katz's newest book and can't wait to read Second Chance Dog: A love Story about his wife's dog, Freida, "the dog who kept men away". The sample chapter available on Amazon whet my appetite and I can't wait to read it cover to cover! Jon Katz is not only a New York Time's Best Selling Author but our Common Thread Give-Away Artist for January. 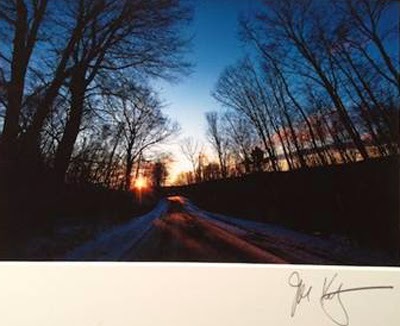 The picture above, "Morning Road" is signed and matted and ready for an 11 x 14 inch frame. In order to register to win this free give-away, please simply go to his wife, Maria Wulf's website, www.fullmoonfiberart.com and leave a comment there for Jon. The winner will be announced on Sunday versus Thursday of this next week. Jon is a man that I am so proud to call my acquaintance and friend, since participating in the Pig Barn Gallery Show and Sale on Jon and Maria's Bedlam Farm a few years ago.They have since moved down the road to a smaller version of their original Bedlam Farm, retaining all of the original creative charm of the first, a charm that comes from Jon's love of his wife, Maria and the love that they share for their many animals and community that surround them. To know Jon is to love him, and to read his work is to get a bird's eye view into the heart of this dear man. His list of New York Times Best Selling books are not Jon's only accomplishments however. Jon's blog, Bedlam Farm Journal,(Bedlamfarm.com) starts my everyday. Unlike other news of the day, Jon's news is guaranteed to start your day with a focus on what is good and prevailing in life. His blog beckons me to see my own life differently and live it to the fullest. Though Jon may not realize it, his writings often stimulate my thinking which inspires many of my own writings. I think that that is Jon's gift to the world. He is unique and he staunchly supports the uniqueness in those around him and his stories bring that to his readers everyday. Jon's talents and abilities don't stop there. His wonderful photography captures the very soul of the animals and people that he writes about, as well as the country that surrounds him. He never tires of capturing that fresh vision of his world, sending it out to all who subscribe to his blog. He has also been known to use other mediums to express his joy with the world. He is a man who never seems to grow tired of exploring and expanding his life and sharing it with others. He has even been featured in a special TED talk recently about his gift of living life to the fullest no matter what age. I understand that he was warmly received by his live audience, and I cannot wait to hear and see this special program. Before I end this blog, I must share a true "Jon Katz story". 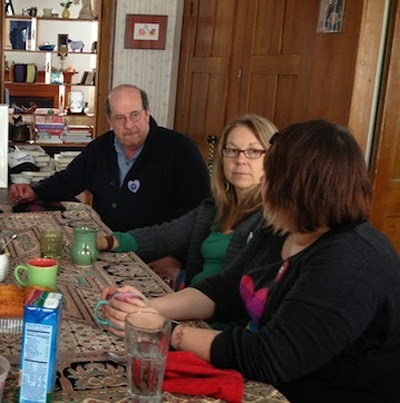 Last spring, he and his wife, Maria hosted a lunch for our Common Thread Artist's group. Jon was the featured cook, though his talent was not show-cased by he or Maria, as being the perfect host and hostess that they are, their focus was on us as their guests. I had brought some of my felted heart pins that I had made and opened the box of them for each to choose one they liked best to keep. It was a bit of a hostess gift as well as a gift for the other members of our group. I narrowly had thought of them as gifts for the women in the group, but was pleasantly surprised that Jon wanted one too. For many weeks after that I would see pictures of Jon with my felted heart pin worn for all to see...and realized then how fitting this was for Jon, for with or without my heart pin, Jon truly wears his heart for all to see and know. I cannot think of a greater gift to give to the world Jon, nor a greater compliment to give to you! You are indeed a special gift to us all! Thank you! !